The fleet: Troll, Ogre and Chariot (aka The Nest). 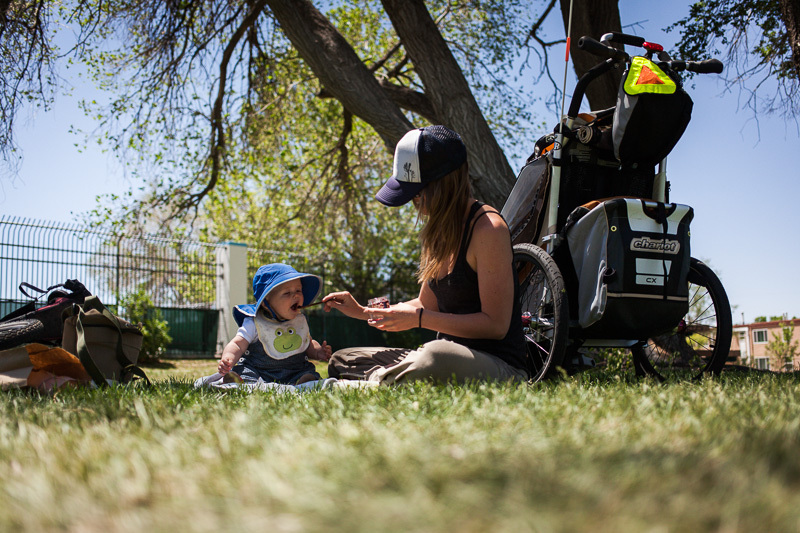 Now that summer’s arrived, we’re preparing for out first multi-day campout with Sage. Our plan is to carry our usual lightweight bikepacking gear, with a hitch on each bike so we can alternate pulling the Chariot CX1 trailer – which has a reasonable amount of stowage space to supplement our framebags. Sage is now just over 6 months, and has been riding in the Chariot since he was 10 weeks old. Terrain will be a mix of quiet paved roads and well surfaced dirt roads. Distances will be short, with lots of playtime scheduled for Sage. Sage’s luxury sleeping apparel. Room to grow. Diapers. Normally we use cloth diapers. On this occasion we’ll use disposables, but we’re investigating gDiaper hybrids, with biodegradable inserts for travelling. His night time story book, pacifier (natural rubber, Natursutten, attached with a Binkie Bungee to his clothes) and the little monkey he likes to hug when falling to sleep. Sage is still predominantly breast feeding. 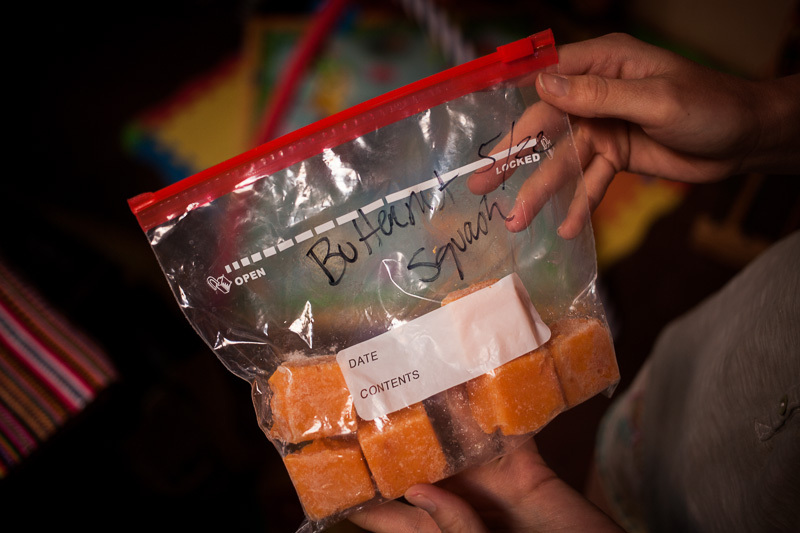 We’ll also take avocados and bananas (easy to mash and liked by everyone), plus homemade frozen butternut squash and peas (to be eaten on the first day), with a couple of Happy Baby organic food pouches. Eating accessories include bib, washcloth, wooden baby spoon and Kleen Kanteen Sippy Cup for water (which he’s learning to use by himself, clever boy). Sage likes his picnics. And his food. Given our location in the high desert of northern New Mexico (Santa Fe’s elevation is 7200ft/2200m), a good sunhat is a key ingredient in Sage’s packlist. 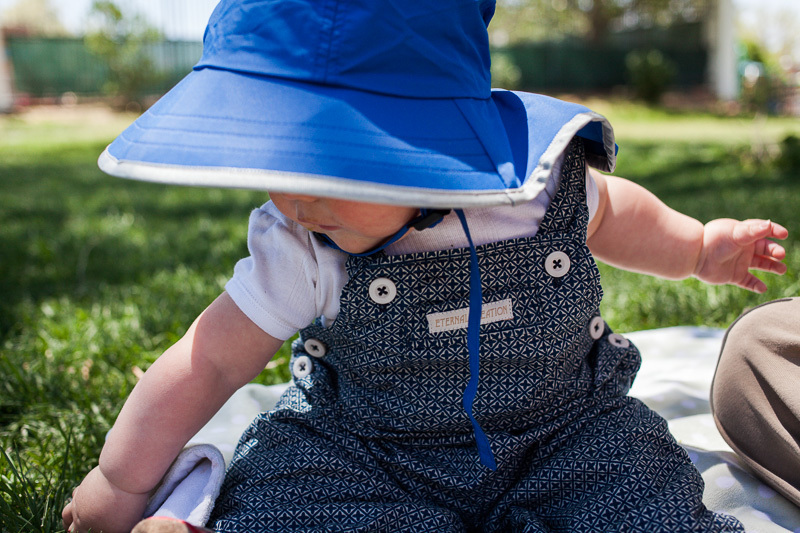 This one by Sun Day Afternoon is rated to UPF 50+, and broad enough to keep his face in the shade and cover his shoulders. Frozen, pre-prepared butternut squash, blended then placed in an ice tray. Easy to make. Easy to serve. We’ll all sleep in a Black Diamond Megalite tarp (2lb 5oz/1.05kg) with Bear Paw Wilderness Design bucket groundsheet. We’re taking a Boba Air baby carrier, which packs small and weighs 320g – handy for carrying Sage while pitching the tent or walking around. 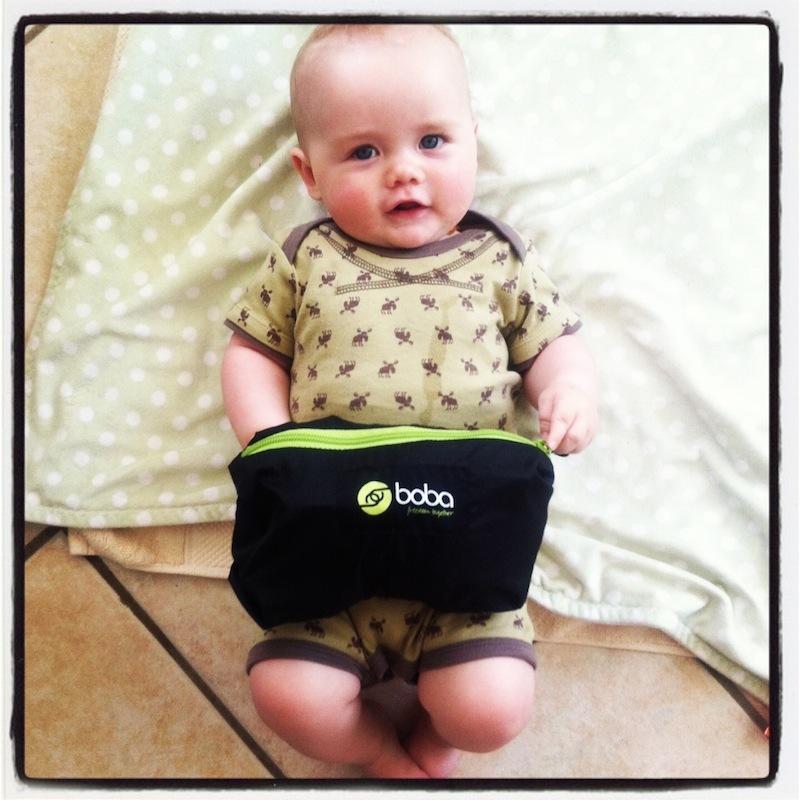 Sage models a packed Boba Air, a minimal and relatively lightbaby carrier. Chariot CX, with a hitch on each bike. We’ve added sealant to the inner tubes for goatheads, thorns and cacti. Disclosure. Bike Shop Hub is an Affiliate of this site, which means I received a small percentage if you purchase a trailer (or anything else) through this link. Right now, they’re offering great sale prices on 2011/2012 Chariot trailers, with 25-35% discounts on all models. We went for the top-of-the-line CX and it’s doing us well (the removable side panels are great for the summer heat). Note the Cougar is cheaper, with the same excellent suspension system and chassis that makes it so well suited to dirt road travel. Here’s a preliminary review with our first impressions. The Chariot CX 1. Not the cheapest trailer on the market, but it’s impressed us with its plush ride, attention to detail and dirt road capabilities. If anyone has any baby camping tips, please let me know! You’re so prepared and still managing to pack light. Impressive. Beautiful. He will enjoy the fresh air! Surely ‘Tykepacking’? The blog is great, also nice to see someone giving some love to Bristol. Good setup. We tried g diapers and they did not make my endorsement list. We had pretty chronic messy results and they were almost as innefective as no diapers at all. We ended up using seventh generation diapers, I am not convinced they are very green, but they hold stuff in. We had a chariot cougar for our first kid and we went to a cx2 for the second. 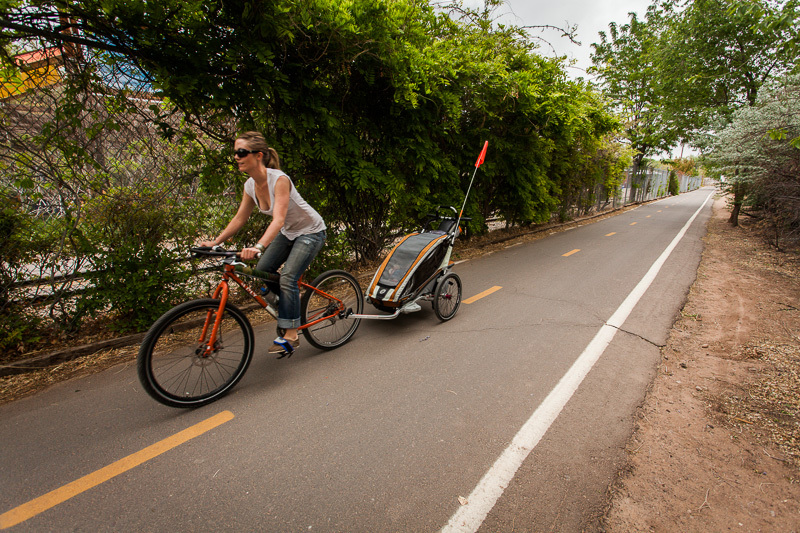 We switched to a CETMA cargo bike for riding, but kept the chariot for skiing and hiking. 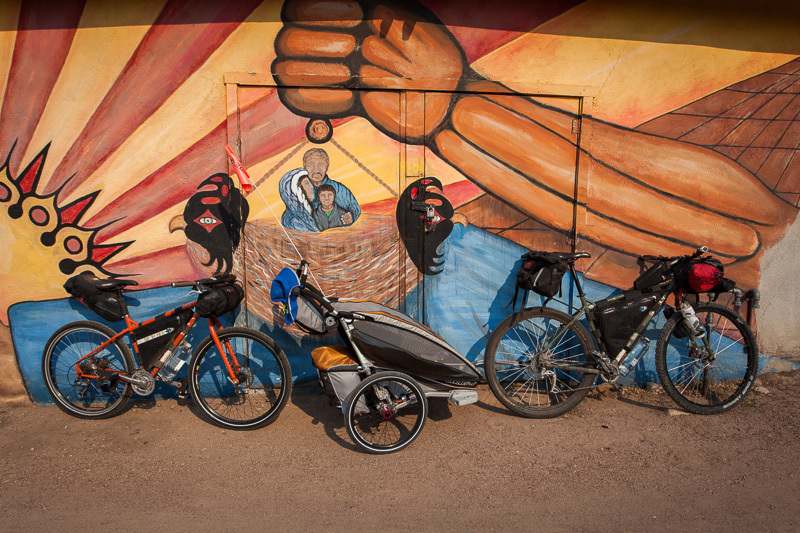 The chariot was really tough and took a lot of abuse – we took it hiking a bunch of times and used it in place of backpacks for the family. Thanks Doug – will pass that on to Nancy. Seventh Generation are the preferred choice here too. Any particular reason you jumped up to the CX for the double, rather than staying with the Cougar? The Cetma looks really cool. I got the cougar in 2001 when it was top of the line. When it was time to go to the double, the cx had better suspension and the removeable side windows and the much better handlebar. The big feature for me was the drum brakes, which I used all the time for walking down hills, especially in the winter. I did a lot of walking and hiking with the chariot, and the brakes made things much easier. Too bad they didn’t work for skiing. I once had both kids and 72 bottled beer in the chariot and it did not break. The CETMA is awesome. I have an adaptor to put the chariot on the cargo deck as well, but once Finny was big enough, we usually just put her in the box. If you are ever in Calgary, you are welcome to borrow it if I am not on a trip with it. Actually, turns out the 7th Generation nappies can be a bit leaky for some reason or another, so we stick to Pampers. He’s in cloth diapers in the day, which work really well, so it’s just one at night. I’m not sure what we’d do on a longer trip. The waste created by disposable diapers bugs me, but I’m not sure how practical cloth diapers would be to wash and dry out en route. Looks like the Cougar and the CX have the same suspension system now. I just needed to shim out the hitch a bit to clear the Rohloff EX box on the Krampus. I was about to use the Chariot with the fatie when i noticed the same issue. Will have to sort it for this weekend – have another overnighter planned…. When I was in Nicaragua with Megan and her child, I just found some big spacers from a machine shop. The skewer was just long enough. Bike Trailer Shop does these chunky ones for a few dollars. Wow! I can barely plan for my own gear much less for a little dude. Cass you and your wife could be up for “Parent of the Year” award banquet!! Cute in his little Patagonia! Great post, Cass. Love it when the little ones get out too. Way to take on the tykepacking challenge. We also have the tout terrain singletrailer in mind for enabling family offroad outings but its indeed expensive for ists restricted seeming everyday usability. How does the Chariot handle rough sections? 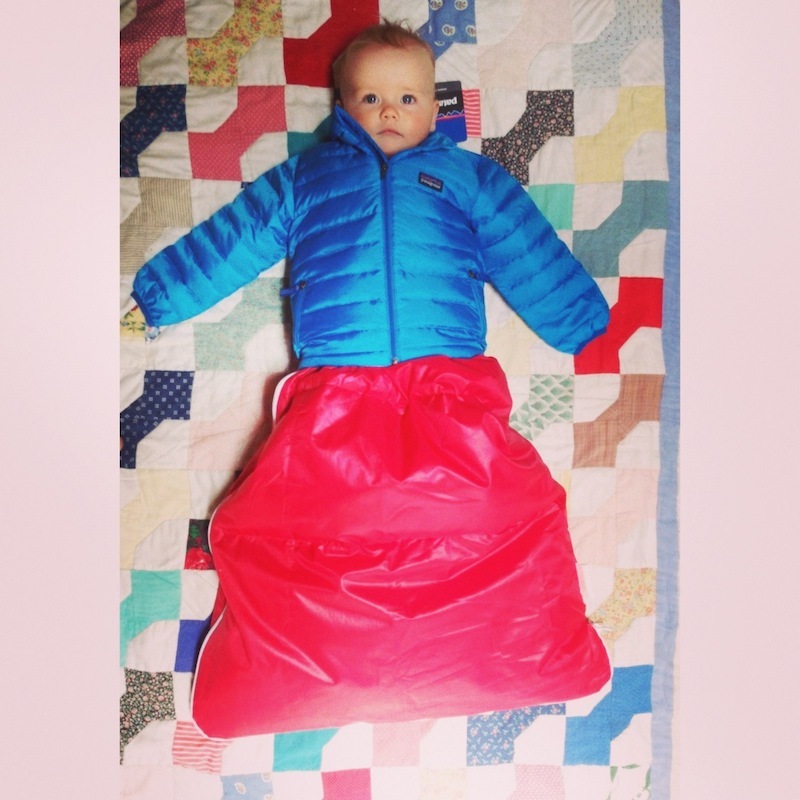 Thanks for the helpfully looking links concerning baby outdoor gear! I’d love to try out a Singletrailer. The Chariot, when there’s weight packed low, feels really stable off road. We’re just back from a short overnighter, finishing up with a pretty rough descent. The trailer tracked really nicely – I was impressed. The other advantage of the Chariot is its cargo capacity. The Singletrailer would come into its own on narrower trails. Had we had one, we may have pushed on up a road that whittled down to an overgrown singletrack this weekend. The Singletrailer is also lighter, and I like the built in kickstand. I have a Tout Terrain Mule, and that uses the same concept. It’s really nicely made too. He’s looking very grown up in his tykepacking gear! Seems we have a whole new generation of little cycle tourists out there.